June 16, 2015 - The boy and I managed just a single trip to McDonald's in the past month, and each scored a NERF squirt gun. 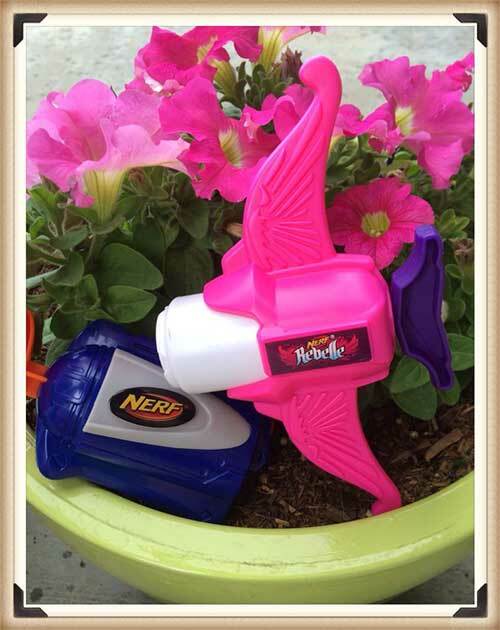 The "girl version" looks like a pink bow, but shoots water instead of plastic or foam projectiles. - McDonald's has a joint promo of NERF and NERF Rebelle in their Happy Meals. The next promotion shown is from the Minions movie, twelve different talking toys. The boy has already requested that I "just buy the whole set from eBay." - The Chick-fil-A site shows Artzooka puppet kits as the goodies in their Kid's Meals. The under 3 toy is a board book. - The Wendy's site is featuring Dreamworks Dragons: Race to the Edge toys in their kids meals, with All Hail King Julien coming soon. The under 3 toy is a board book. - Sonic has Moshi Monsters toys that they are promoting in their Wacky Pack meals. - The Captain D's web site does not show the current promo for their kids meals. - Subway Kids Meals have six different Inside Out messenger bags. - The Carl's Jr. and Hardee's both have Bass Pro Shop Kids toys and activities. Starting in the middle of August, the promotion changes to Home. - Burger King's kids meal web site features Slugterra and Lalaloopsy toys at the moment.